I was invited to Weslodge (Twitter: Weslodge, Facebook: Weslodge) on Monday for the launch of their Cutting Board, an impressive meat platter featuring a selection of grilled meats and poultry. Available on Sunday and Mondays from 5pm onwards, discerning carnivores at the popular King West restaurant can share a platter of succulent beef, pork, lamb, and poultry which have been aged, marinated or slow-cooked to delicious perfection. Served as part of a special pre-fixe menu The Cutting Board is, in my opinion, very reasonably priced at $29 per person. We started the evening off with a welcome cocktail. Bombay Sapphire Gin, Campari, sweet vermouth blend, orange oil. Aged in American Oak. Rich bitter grapefruit, deep toasted orange peel with a subtle spiced vanilla oak finish. Next up, my favourite appetizer from Weslodge: their Scotch Egg. Wrapped in a layer of tasty chorizo then coated with breadcrumbs and deep fried, this Scotch Egg has a beautiful bright yellow yolk that's still runny in the centre. The addition of sweet and tart tomato jam alongside black truffle elevates this traditional English canape from good to amazing. CRISPY HEN: The crispy hen is marinated overnight in bourbon and cayenne pepper then sous vide for several hours. Next, the tender white meat is coated in a rich buttermilk batter and fried to a golden crispiness. LAMB RIBS: To create fall-off-the-bone tenderness, the lamb ribs are rubbed in a smoky, full-bodied coffee and bourbon mixture before being slow-roasted overnight . Each rib is glazed in a sticky house-made sauce and finished with Sicilian pistachio crust. DUCK SAUSAGE: The duck sausage is a unique interpretation of a German wurst sausage. Seasoned and stuffed in sausage casings, the Muscovy duck meat adds a moist richness and complex earthiness to the traditional breakfast sausage. DRY AGED RIBEYE: Racks are dry-aged for a minimum of 38-days so that the meat slowly matures to an intense earthiness. It is then carved down, seasoned and cooked. PULLED PORK: Marinated overnight first in a adobe-style marinade of soy, white vinegar, bay leaf and sweet lemon/lime soda, the pork shoulder is then slow-roasted so that it pulls apart effortlessly. CUBAN SLAW: The slaw consists of a medley of julienned vegetables pickled in-house, white wine vinegar, carrots, jicama and apple. BAKED PASTA: A refined mac n’ cheese made with orecchio pasta coated in a creamy béchamel and buffalo ricotta cheese sauce, served with a bacon crumble on top. JALAPENO BISCUITS: Warm house made buttermilk biscuits with a hint of spicy jalapeno. We were served two sides with The Cutting Board. First, a light and delicate pan-browned spaetzle tossed with wild mushrooms and savoury lamb bacon. I absolutely loved the rustic quality of this dish. Second was a warm Brussels sprouts salad with house bacon. The bacon adds a wonderful smokiness o these nutty and sweet Brussels sprouts. Infusing a more savoury element (the olive oil pudding) alongside the rich chocolate mousse, this "instant cake" dessert showcases a crave-worthy balance of flavours. 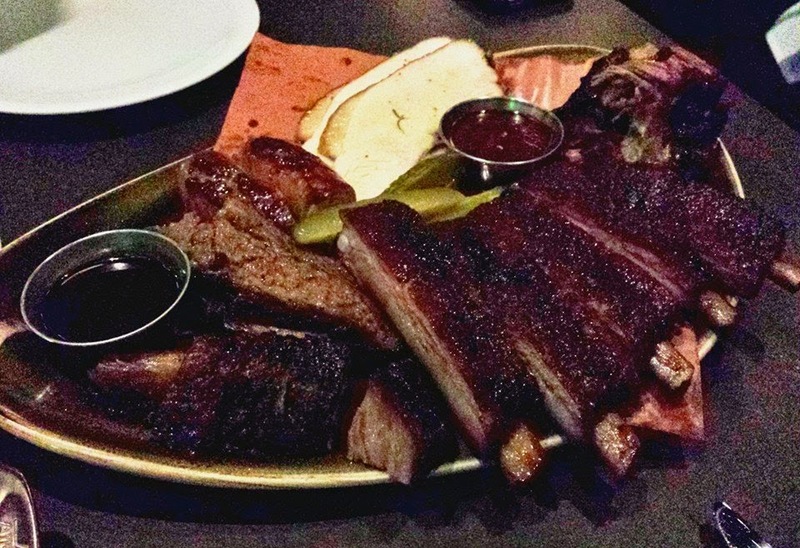 After tasting the meat platter at both Weslodge and at The Carbon Bar, I much prefer Weslodge's Cutting Board over The Carbon Bar's Pit Master Platter. Aside from the beef brisket - which was indeed very delicious as it was tender, moist and very juicy - everything else on the Pit Master Platter was pretty average (actually the pork ribs tasted quite bland and the turkey breast was dry). In comparison, everything on Weslodge's Cutting Board was marvelous. Not only is the platter beautiful to look at, all the meats were moist and full of flavour; nothing was bland or dry. Although there may be more meat on the Pit Master Platter I still much prefer the presentation, the taste of the different cuts of meat and the variety of side dishes (baked pasta + biscuits + slaw vs. pickles) on The Cutting Board (Note: When I visited the Carbon Bar in January their Pit Master Platter was $29 pp. It is now priced at $27 pp).